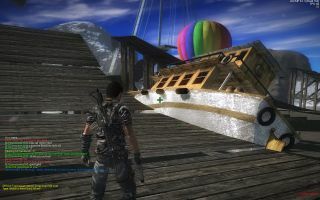 Just Cause 2 Multiplayer is an insane mod that allows hundreds of players to do stunt jumps off of jumbo jets at the same time. We're going to jump in to play on JMan100's Freeroam Construction Sandbox, which we recently wrote about . Hit our Twitch channel at 4:15 p.m. PST to follow along! Update: Thanks for watching! The stream is over, but if you want to catch an archive, click this wonderfully convenient link .